Goal: Protect animals from being strapped to the outside of moving vehicles. A bystander captured a video of a dog named Zeus tied to the top of a trailer speeding down the highway. The owner, a man taking his dogs to hunt, didn’t face any criminal penalties for his actions since authorities claimed that “no crime was committed.” This is outrageous and the laws must be changed to ensure no dogs can be abused like this is the future. Authorities did follow up with the hunter and conduct a welfare check on Zeus. The hunter claimed that his dogs enjoy traveling outside the car and were not in any danger. In the video, Zeus can be seen attached to the top of a kennel that was holding two other dogs. 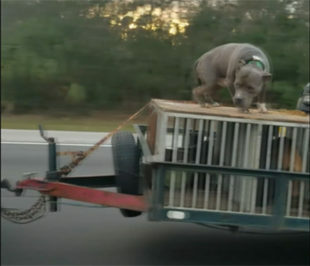 Technically, the owner is correct, since in Flagler County, it is perfectly legal to strap a dog to the top of a trailer or other vehicle, while speeding down the road. Of course, pet owners should do more than just what is “legal” and have a moral obligation to protect their animals. Additionally, Flagler County’s tether laws are outrageously weak and must be strengthened. Sign this petition to ask Flagler County authorities to pass a proper animal welfare law that prevents owners from strapping their pets to the outside of moving vehicles. In your county it is legal for pet owners to strap their animals to the outside of moving vehicles. Because of this, a hunter who was recently filmed with his dog strapped to the top of a trailer driving down the interstate, did not face any criminal penalties. This is outrageous. Animals deserve better than this and must be protected from owners who are willing to endanger their wellbeing. We, the undersigned, are asking you and your fellow supervisors to pass legislation that will make it illegal to strap animals to the outside of moving vehicles. Other jurisdictions already follow this commonsense rule, so I would hope that Flagler County will do the same. Dog Throws The Funniest Fit After His Owner Tells Him He Got a New Pet.